Since Lash Boost has not been on the market yet for long, we can’t guarantee for sure that this product is totally risk-free. Knowing the possible side effects may help you plan and manage them. If you experience any of the following, immediately stop the use of the product and consult with your healthcare provider. Eye itchiness/redness. For some, especially if you have very sensitive eyes, a mild tingling sensation may occur. But this is said to disappear with continued use. Just make sure that none of the serum will get into your eyes to avoid this side effect. If, for instance, some of the product accidentally gets into your eyes, rinse them thoroughly with water. Some may also experience temporary eye redness for the first few days, especially if too much product is used. See a doctor if redness and itchiness persists. Eye/skin irritation. 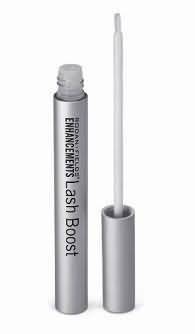 Since Lash Boost is applied closely to the eye, it is also possible to your eyes and/or skin around the eyes to become irritated while using the product. Make sure to use it correctly, and wipe away the excess before applying it to your lash line. And for those with nut allergies or any health concerns, please consult with your doctor prior to using the product. It contains almond that may not be safe for those with nut allergies. What’s in the product? Full ingredients list..
Water, Butylene Glycol, Hydroxyethylcellulose, Keratin, Hydrolyzed Keratin, Biotin, Sodium Hyaluronate, Isopropyl Cloprostenate, Octapeptide-2, Allantoin, Panthenol, Copper Tripeptide-1, Pantethine, Polypeptide-23, Cucurbita Pepo (Pumpkin) Seed Extract, Glycerin, Sea Water, Malus Domestica Fruit Cell Culture Extract , Hydrolyzed Glycosaminoglycans, Prunus Amygdalus Dulcis (Sweet Almond) Fruit Extract, Backhousia Citriodora Leaf Oil, Dipotassium Glycyrrhizate, Rhizobia Gum, Styrene/Acrylates/Ammonium Methacrylate Copolymer, Xanthan Gum, PVP, Lecithin, PEG-12 Dimethicone, Alcohol denat, Chlorphenesin, Phenoxyethanol, Sorbic Acid, Sodium Hydroxide. Watch Mary Radford, the Director of RF Connection at Rodan + Fields, as she explains what Lash Boost is all about. Also, discover the proper way of applying this newly-developed product. 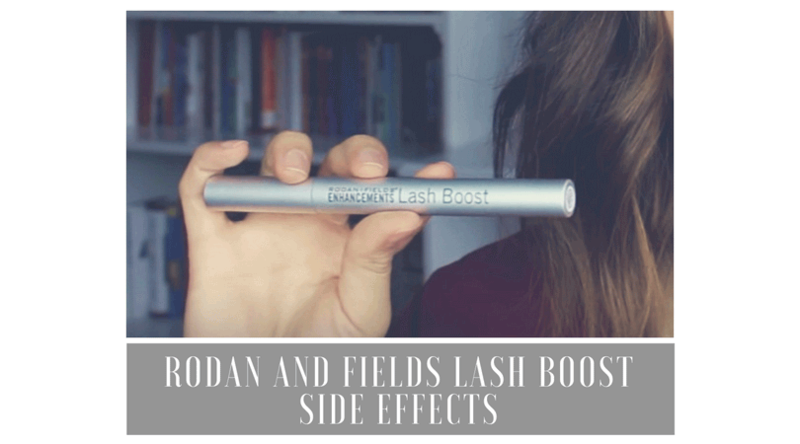 In the last part of the video, Radford mentioned the side effects that you may experience with using Lash Boost. She also advised users to discontinue the use of the product if any complications persist and recommended to consult with your healthcare provider. Rodan + Fields is a well-known American company specializing in skincare products. Lash Boost is one of their latest products launched in 2016, which promises to make lashes appear fuller, darker, and longer and is available for use for almost all skin type. However, despite its tempting claims, we can’t totally recommend this product to those who want to get beautiful-looking eyelashes. It’s a new product and still unproven. We can’t even find a reasonable amount of reviews to say that this product is really well worth a try. If you are considering Lash Boost, though, we advise that you see your doctor first before trying it. Read our full Lash Boost review here. I bought Lash Boost for my EYE BROWS. it was improving the thickness and after a while I decided to use it on my lashes as well. I am sorry I did. “ hooding” as well in the outer corners. Many oif my friends sell and promote R+F so I’m hesitant to post my story on line. I don’t want to damage my friendships, but I won’t be using ANY of their products as after researching, I have found most of them have ingredients that are not healthy. Sick over this .. I hope it’s not permanent .. I have decided to stop using Lash Booster as well. I have been using it for 2 1/2 weeks. I have been experiencing tingling, redness and dryness. It’s not worth it! I hope this sensation goes away soon. I will use the rest just on my eyebrows. I’ve been using Lash Boost for 5 weeks. I started on my eye lids as directed. within a week I had redness and itching plus very dry eyes so I stopped. I already have glaucoma and take meds so I am not risking my eyesight to have better lashes. Next I used it to make my brows fuller. Id apply it once per day to each eye brow. I noticed more hair growing in and I noticed it was grey versus brown. I am in my 60s so thought oh well I am older but… today I now have a mustache! Honestly I’ve not had course hair issues on my lips or chin like some other women my age have had. But as of today I have white course hair growing on above the corners of my mouth. I’m done. This product is in my system and definitely not making me prettier. I just wasted a lot of money. Buyer Beware especially you older ladies! I have been using Lash boost for over two years and have loved it I love my long long lashes. I used Latisse before and stopped it due to the discoloration to my lids. recently a friend saw me with no makeup and commented “whats wrong with your eyelid they are so red” I hadn’t noticed really…. I look terrible I have to put a light shadow on if I want to go with out makeup will this go away when I stop using it?